I know, it’s been way too long since we updated the Playlist, but the third installment is finally here. It’s sort of all over the place and I tried to add in a few extra tracks to make it worth the wait so there should be a little something for everyone. This will be the last one I personally compile for a little while, we’ve got some guest playlists lined up for the coming months and they should drop more punctually than this one (once a month or so). Also still working on the recall feature so you can go back and listen to past playlists, I’ll post on that when it’s ready. For now, sit back, relax, and click “Play” at the top of the center column (RSS readers must visit the site). Enjoy! Mux Mool – Night Court is where its at! Yess! I’ve been looking forward to the new playlist for awhile. Great stuff!! Thanks for sharing ;) Love the Bibio song! That For Kate I Wait song is going to haunt me to my grave. It’s nifty at first but then it just doesn’t leave your head… FOR KATE I WAIT OOHHHHHH *jumbled jargon singing*… repeat. I wish I had that Whitest White Boy tune blaring last night. It’s so fitting while drinking tequila at 3:30 in the morning. in the artwork: the space for 4-digit long playlist editions is clearly necessary. Loving the new Grizzly Bear. Thanks! love the cover art. the 4 dig play list number is really funny! it would be great if you added these playlists to grooveshark, that way i could enjoy the old ones later on down the road! careful selection of music, as usual. love your work. Mux Mool rules! Amazing playlist as usual. Mux Mool is the money…and this whole playlist is. thanks guys for all the great suggestions! I tried Grooveshark like you suggested, but a lot of the songs don’t come up on there. I will be archiving these playlists here though, so you’ll be able to access the old ones soon. Ahhhh, nice ! I was anxious waiting for it, amazing ! I love Young Adult Friction !!!! The Royksopp album unfortunately has been a journey to listen to and get to enjoy. After about 10 rotations (of the entire album), I feel that it is a disconnect from previous releases. Best songs: Royksopp Forever (track 5) and What I Want (track 11). Happy Up Here is cool, but would love a remixed album from them. FYI…. dunno if it’s just me but the link to this post under FEATURED POSTS doesn’t work. Sends me to your 404 page. really? seems to be working here, anyone else having this problem? This is a good playlist for sure. I enjoyed the song by 800beloved called galaxies. This band is going to be a summer fav for me. I just got the CD today. Props for good choices in music. This playlist is fantastic. I love every track. Love the Grizzly Bear and the new Tycho mix. Light Powered is a good selection by Deastro, but I am really diggin his Wind Powered. how do you find such brilliant music? i always visit ISO50 for good tunes. it’s inspiring. THANK YOU!! nice mixtape…. that experimental aircraft song is simply amazing…. Excellent mix Scott. Most I have heard from whoring out Mood Gadget but theres a few I’ll be setting repeat on. I am totally addicted to Eliot Lipps new album also, stunning stuff. I have had the same problem with grooveshark. They have a lot of music on file but new songs and lesser known groups are hard to come by – because no one has uploaded them yet. I noticed that when i was trying to listen to a group that you had posted here before. Thats part of the reason that I keep coming back to this site though, great music that I really wouldn’t get to hear anywhere else. I must say – the selection is a really nice treat. is this available for purchase/download by any chance? Real nice playlist guys, some proper gems in there, Mux Mool and Moderat being up there. Damn, I really really really love that Manual remix! Maybe time to post some manual tracks up there as well? He still is way to unknown in my opinion for the awesome music he creates. Mad respect for the playlists, they really let me discover the great music which is out there! where can i find manual remix because that song is just amazing! The rest is just as amazing to very nice playlist. keep making sick tracks. 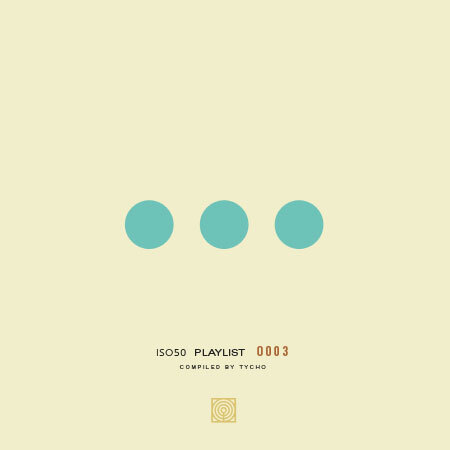 I made a spotify playlist using many of the songs in ISO50’s playlists, also some of my own favourites. Thanks for making my morning x2 groovy! love royksopp – they make my yorks pop! great list – where are playlist #1 & #2 ??? I’ve been listening to that Experimental Aircraft song ever since this playlist has been up! So good. Thanks for sharing it with us!